This term my 10 Bridging Maths Class is doing Trigonometry and Measurement. I usually find that Trig has good, real world contexts, and measurement is nice and visual, but I still knew, when I was sitting at home the other day trying to plan for my first lesson with them, that it was going to be a struggle. They don't have quite this same attitude towards it for some reason. Our first lesson was a double, so I did some actually educational reading and tried to find something to jazz things up. I found this video (below) about how there's no such thing as being bad at maths, you're probably just lazy (assumedly putting aside legitimate learning disabilities or imbalances in the brain), and I found that to be quite effective, more than I'd expected (hint: I don't necessarily expect a lot, students from year 9 to 11 are pretty apathetic). 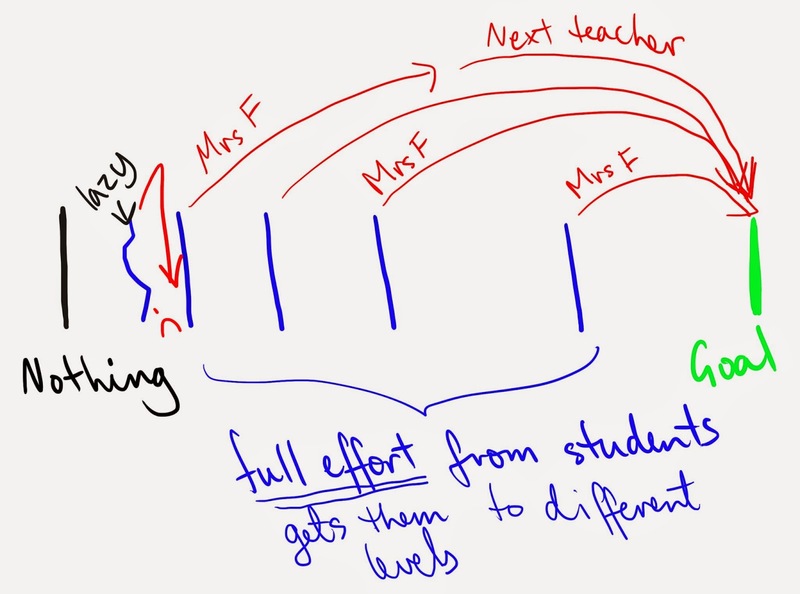 I managed to get quite a few students to admit that they don't really put the effort in that they could when I explained that I am there to help them bridge the gap between them doing their best, and what they want to achieve. I pointed out that for some people they might still be working on that bridge next year, but no matter how big the gap they're trying to fill, it can only work if they're putting in their best effort and have the best attitude they can, or else it's like building a bridge on a bad foundation. Many students then put their hand up when I asked if they wanted to start fresh, and try and put in their best effort this term. It was rather touching. I nearly cried. Once I had them focussed, I introduced out topic with this not-as-lame-as-I-was-expecting video which the students found amusing and I felt the need to dance to. I wish this school's math (it's in America, so it's math, not maths) department would make more, but I have the feeling it's not going to happen, even though their videos are actually really good! See? You were expecting it to be lame, and it was actually pretty good. 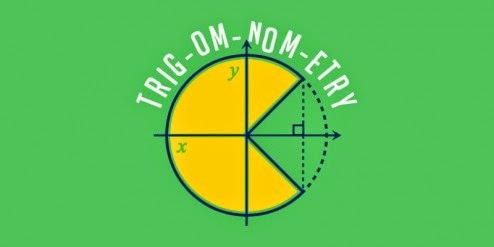 I'm actually planning to use this throughout the Trig part of the unit to help them remember the sides and formulae. With my bridging class I always spend the first few lessons doing foundational processes that will be relevant later on. The digital copy of the textbook has worksheets related to 'review' questions at the start of the chapter, these are great to get the students warmed up in the first week, and to remind them that homework is actually important and that I expect them to do it. I did an activity with them to get them practising Pythagoras' Theorem. 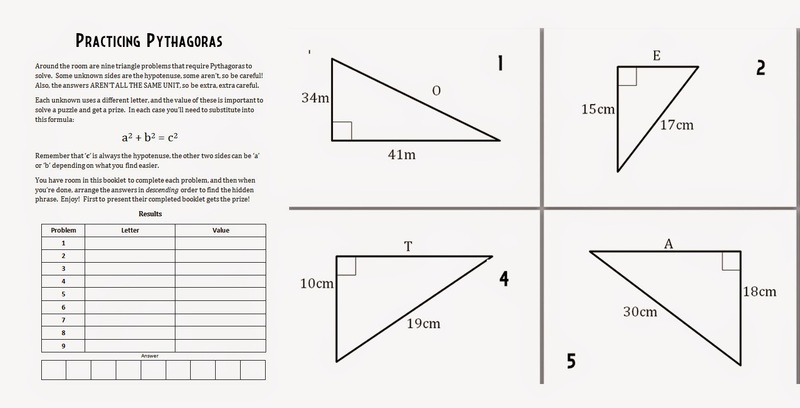 I actually came across the idea on a teaching resource site...but they claimed it took them 5 hours to make and it was for actual Trig questions, not Pythagoras, so I made my own in under an hour. A this point I hadn't thought to check the difference between 'practice' and 'practise', shh. 9 Pythagoras problem were stuck on the walls around the room, and after I showed them 2 quick examples, they had to wander around and solve them at their own pace. The first three to finish got a chocolate, the next 2 got bonus points. It went really well, and a student who has had maximised bad attitude all year tried her hardest and didn't give up when she made a mistake and even got bonus point. It was rather touching. I nearly cried.